“Disc, Identity, No 2, red”, which was removed from Vincent Horridge’s body after he had been killed. 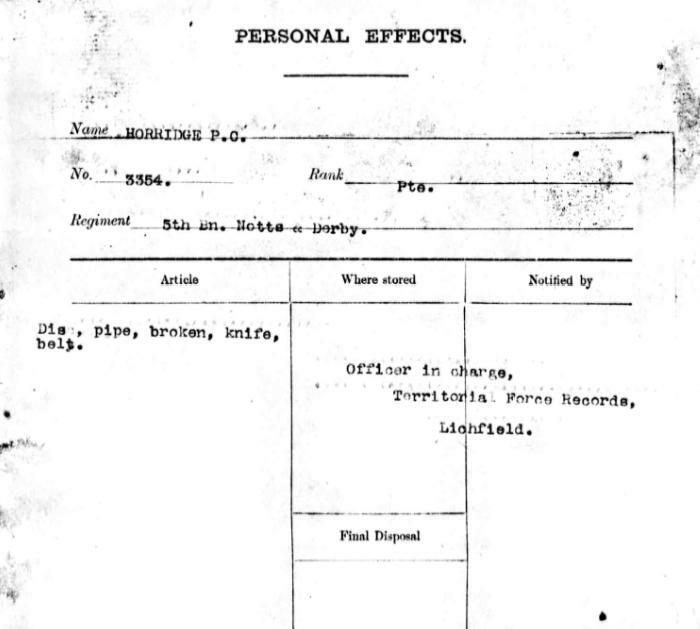 Vincent Horridge from 13 Belvoir Street, Ilkeston enlisted into the 5th (Reserve) Battalion Sherwood Foresters on the 4th November 1914 aged 23 years and 6 months. 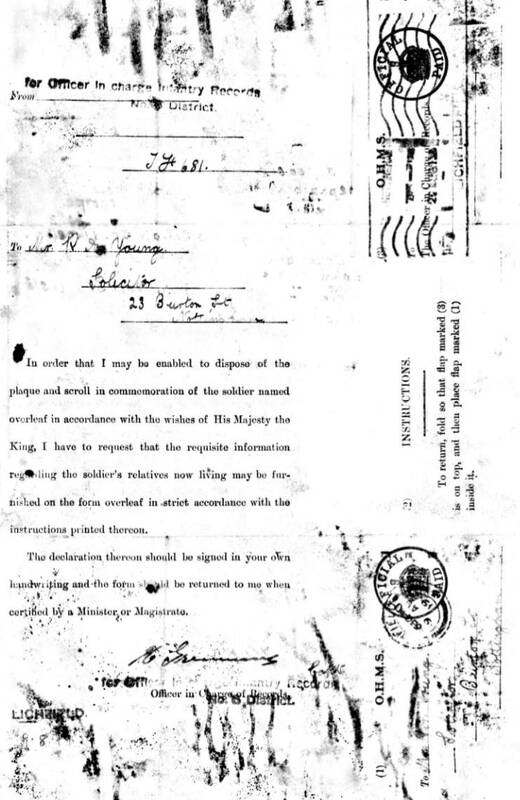 After training with the 9th Home Battalion and the 3/5th Battalion he was transferred to the 1/5th Battalion and embarked for France on the 21st April 1916. Victor joined the Battalion in the field in May 1916 and would therefore have participated in, and survived, the battle of the Somme on 1st July 1916. He was killed in action in the trenches near Fonquevillers on 21st January 1917 and is buried in Foncquevillers Military Cemetery. The 5th Battalion took over trenches vacated by the 6th Battalion during the evening of the 19th January, possibly in the Right Sector of X2. However, his death did not even warrant a mention in the War Diary ! 4216 Pte J Chapman aged 22 and died of his wounds on 23/01/1917. He is buried in Warlincourt Halte British Cemetery, Saulty, iv. 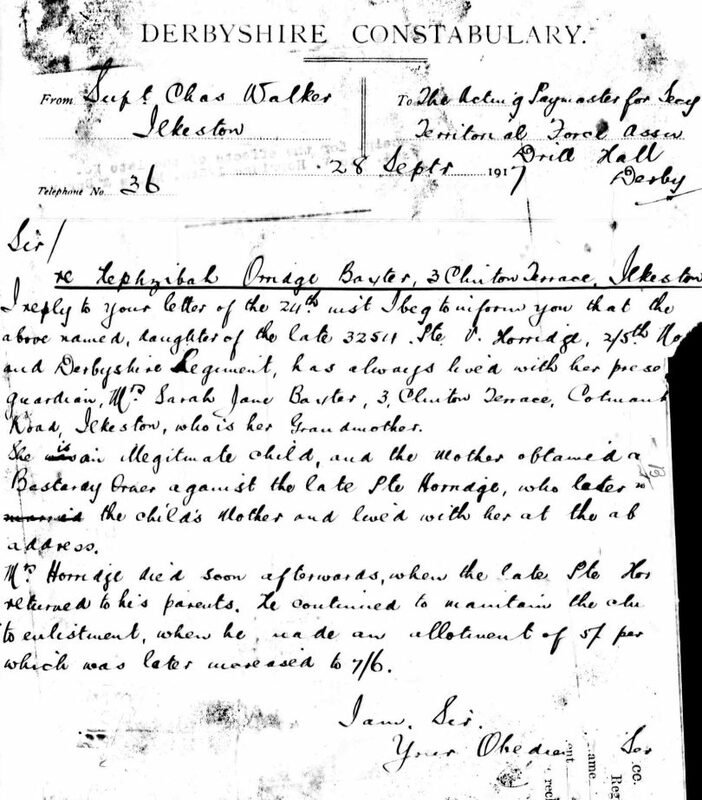 g. 2., son of john and elizabeth chapman, of 1, common side, swadlincote, burton-on-trent. 4666 Pte Francis Goodchild aged 21 and killed in action on 21/01/1917. He is buried in foncquevillers military cemetery, i. g. 28., son of the late william james and elizabeth elen goodchild. 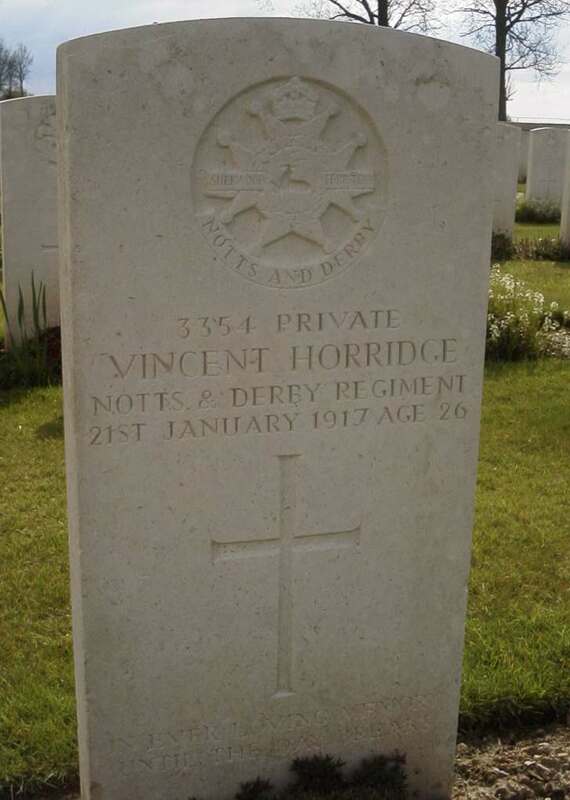 3354 Pte Vincent Horridge aged 26 and killed in action on 21/01/1917 foncquevillers military cemetery, i. f. 13., son of william and mary ann horridge, of 13, belvoir st., ilkeston, derby. 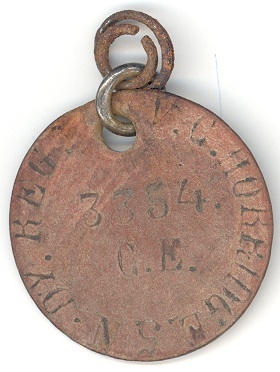 Vincent’s personal effects, including the identity disc, were returned to his Father William who was still living in the family home in Belvoir Street. 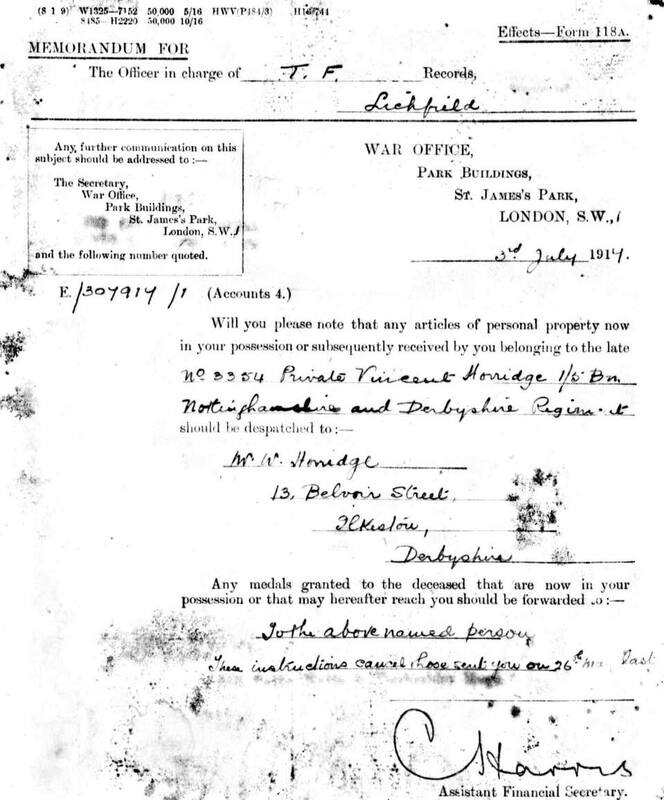 On 28th September 1917 Superintendant Charles Walker reported to the Territorial Force Association that Vincent Horridge had fathered a child out of wedlock. His daughter, Hephzibah Horridge Baxter was living with her grandmother in Chapel Row, Newthorpe following the death of her mother. They were granted a pension in October 1917. Vincent’s British War and Victory Medals were received by his father William in 1921 (above), however, it would appear that the War Office were unable to locate any next of kin for the Plaque and Scroll (below). illegitimate daughter he left behind. I had all the info myself and had visited Fonquevillers and laid flowers at his grave. A very moving experience. Do you have access to any more info about him? I am desperate to find a photo of him as my family never knew where he was buried and had no further contact with the Horridge family after the war.I look forward to your reply. Thanks for your comment. It is very moving isn’t it to visit the cemeteries. We try to get to Fonquevillers every other year our so. Unfortunately I don’t have a photograph. It might be worth looking in the local Derby Newspapers from the time. You may have already done this of course. Have you check with the Regimental Archivist? Thanks for your response. Will follow up on your advice. How do I contact the Regimental Archivist? Out of all the men in the 5th Batallion, why did you choose to put Vincent’s story on the website? His life was very short but quite tragic. Only one of many at that time. Why were his effects given to his father and not his daughter? How long did the pension awarded to my Grandma last? More questions. !! How do I contact the Regimental Archivist? 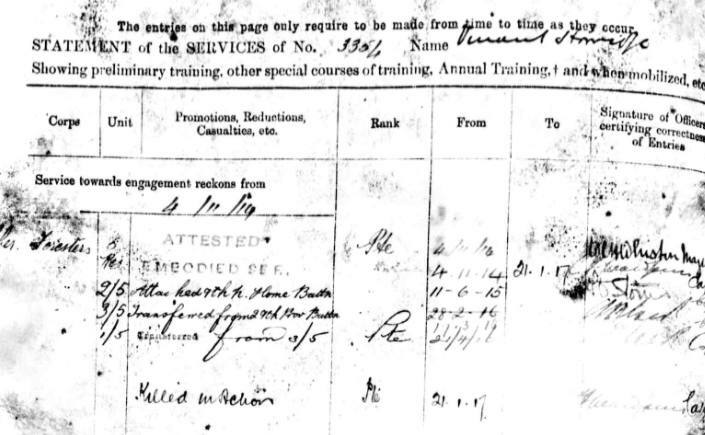 –I’ve contacted a couple of 5th Battalion experts (one is a volunteer at the archives), but unfortunately neither has a photo or any more info on Vincent. But you could still try http://www.wfrmuseum.org.uk/archives.htm. Out of all the men in the 5th Batallion, why did you choose to put Vincent’s story on the website? –Good question, because as you say he is just one of very many men. I have tried to add the stories of specific men when I have collected an item about them or of theirs. Often that is a post card that they sent home or their medals, but in Vincent’s case I actually acquired his identify disc several years ago – hence the need to tell his ‘story’. Why were his effects given to his father and not his daughter? –I guess because she was still a minor? So his effects (and medals) went to the closest adult relative – his father. How long did the pension awarded to my Grandma last? –Perhaps until she left school? At 14 or 15? 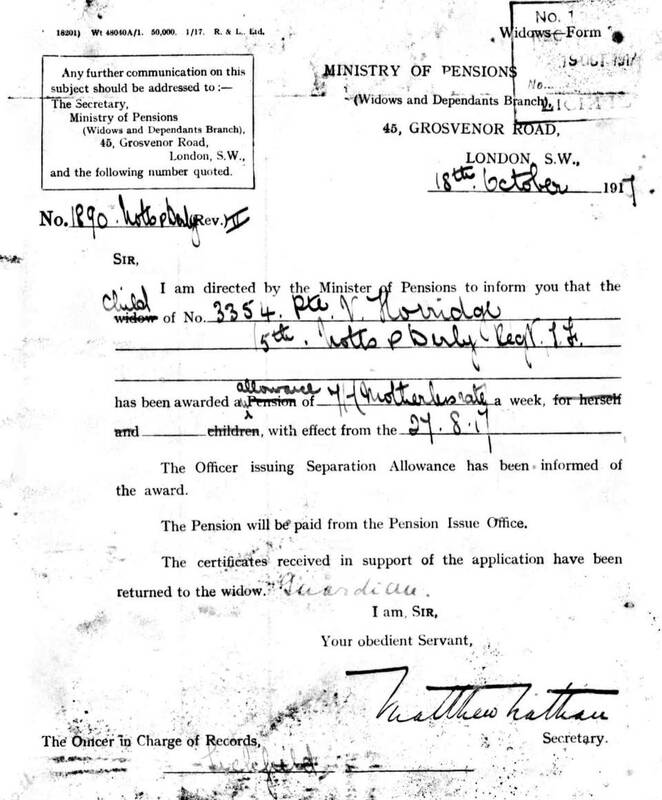 the pension was for 7/- because she was an orphan. Once again many thanks for your helpful comments. Might I ask how you came to acquire his identity disc? Also, big ask here—- would it be possible at some point to actually see the disc and take o photo of it?? My daughter, Jenny, has recently submitted a biographical piece about Vincent as part of her degree course at the Open University.She used a touch of poetic licence and included his first cousin Alfred. He too was a Sherwood Forester and was killed in October 1917. His memorial is on a wall at Tyne Cot,. Have visited there but did not know about him at the time. Don’t think it is too much a leap to assume that they were friends as they were of an age living in the same town. 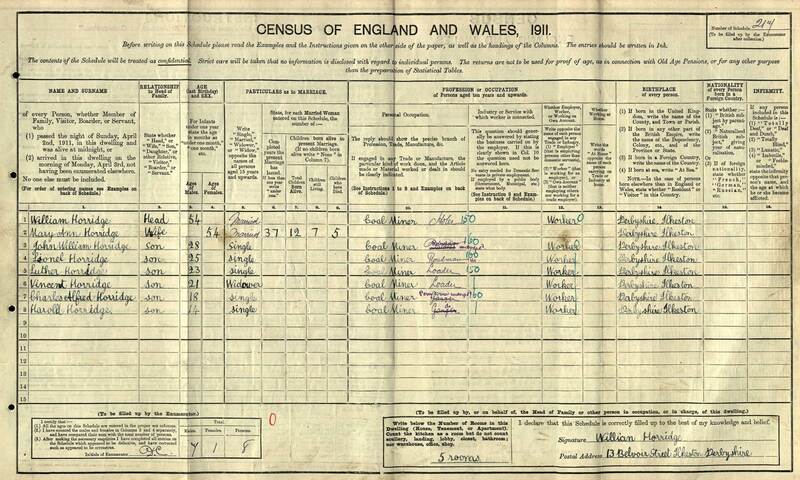 My grandma had left Ilkeston and was living in Doncaster by the age of 14 and remained there. She always talked a lot about Ilkeston, particularly Clinton Terrace, as mentioned in her pension. Vincents life was short but eventful. Quite sad really. Just one of thousands of stories that need to be told.